On June 28, it was bittersweet for Lisa McKenzie to hear the final ruling of Justice Mira Dean-Armorer at the Port of Spain High Court. Finally, her husband, Ricardo "Smokey" McKenzie, could rest in peace. She had the closure for which she had fought long and hard, alongside attorneys Terrence Bharath and Andre Le Blanc. The judge hearing her $20 million lawsuit against the Brian Lara Cancer Treatment Centre (BLCTC) found the medical facility was negligent. Justice Mira Dean-Armorer asked for further submissions on the issue and an assessment of the damages is expected on July 31. McKenzie had no doubt that he was "looking down on her and their two daughters and smiling." The story behind Smokey’s death had made headlines locally and regionally. The man McKenzie knew as husband, father and iconic was half of the St James landmark bar, Smokey and Bunty. 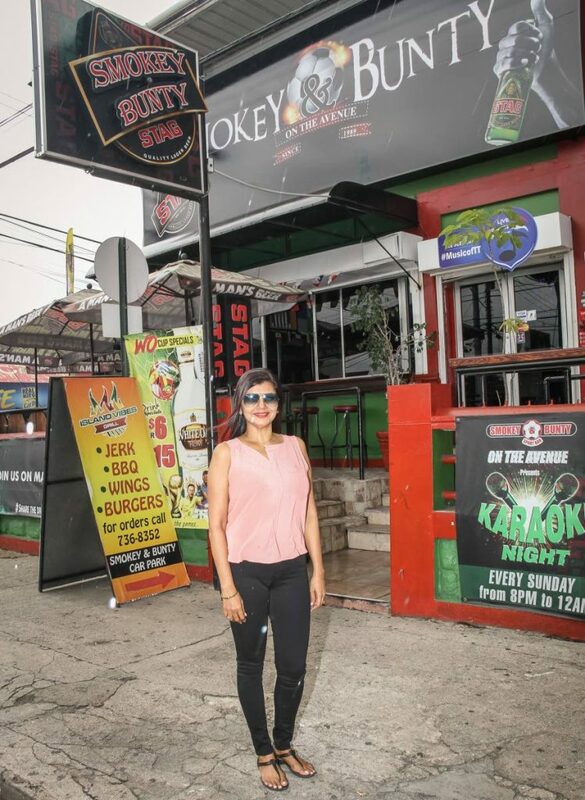 In an exclusive interview with WMN, the former banker sat at the popular pub, now on Ariapita Avenue, Woodbrook, and recounted her time with him, from their first meeting to his death on December 21, 2010. They had been married 21 years when he died. It was because she accepted at the last minute a girlfriend's invitation to visit Barbados that she met her soulmate, she recalled. "Oh boy, how we met... I was at the airport, struggling with my luggage, worried about missing my flight, when this strapping, smiling man walked up to me and offered his assistance. "The next day I hurt my foot swimming at the hotel pool... as it happened, we were staying at the same hotel and he came to my door to ask if I was ok.
“Later that night while at a party – it was Barbados Carnival – I noticed he was checking me out," she recalled, blushing like a teenager. Nevertheless, McKenzie said, she rebuffed his advances – but was left flustered when he simply stepped back, looked at her and declared, "When we get back to Trinidad, I going to marry you!" He calmly told her she needed a good man to take care of her and he fitted the bill. McKenzie said she laughed him off. When they returned to Trinidad, he got her phone number, but she was adamant, telling him she was not interested. He persisted and visited her parents, stated his intentions and asked their permission to court her. Six months later, on June 9, 1990, they were married. The pair became inseparable and less than a year later she gave birth to their first child. "If he was a good man before, he was a greater one when our baby girl, Ornella, was born. 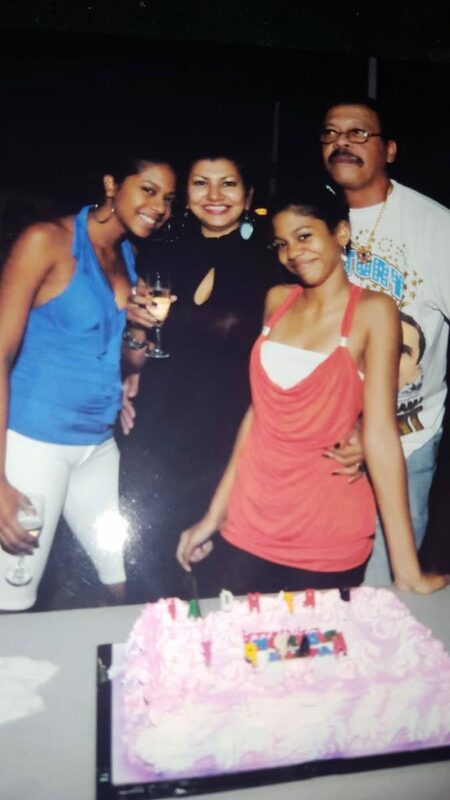 Ricardo was a family man. I was always first…he put nothing before us. "I listen to other women who may have had troubled relationships and I can say God blessed me with a man who truly loved me and showed it – always. Even when he was going,he asked me to love again, to be happy," she said wistfully, glancing briefly at a framed photo on the pub wall. Two years later the couple had a second daughter, Daniella. His years following, she said, were filled with her, their daughters and the bar. Ricardo worked hard, long hours, with her by his side, to provide them with the life he wanted to, she added. Smokey was a stalwart of the St James area, and touched many lives, she said. "One woman called me after he died and said she felt compelled to. She said she wanted me to know that he saved her life once. I tried to rack my brain when he had told me about saving a woman's life, but I couldn't remember. Then she explained." The woman had been suicidal. She had a bottle of weedicide and was intent on taking her own life. The woman, she said, told her she lived in the East, but had boarded a maxi and ended up in St James. 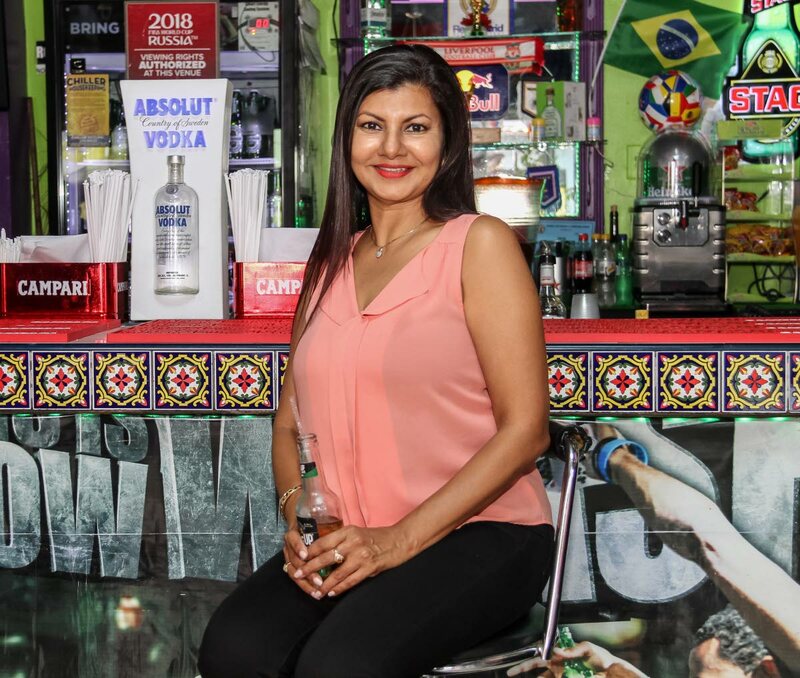 "She said Ricardo approached her sitting on the bench at the bar, which had not yet opened for business, and asked if something was wrong. She said she opened up to him and he offered her words of comfort and pleaded with her not to kill herself, for the sake of her children. He got her to throw the bottle of poisonous liquid away and he put her in a taxi and she went home to her family." As for her husband’s health, McKenzie said on any given day, he could be seen walking around the Queen’s Park Savannah or engaging in a rowdy game of football. "You could imagine how surprised we all were when he first fell ill," she said, shaking her head at the irony. McKenzie had been on her way to the hairdresser when she received a call that Smokey had collapsed at the bar. She rushed back and was told he had had a seizure. However, he was sitting up and jovial by the time she got there, and although he protested, she took him to the Westshore hospital. Doctors there did a brain scan and discovered a mass. A biopsy was done and the family was called into a meeting shortly after. "Cancer, the doctor said, and my world came crashing in," she recalled emotionally. McKenzie said one thing that stayed with her was that her husband remained optimistic throughout his entire ordeal. The doctors recommended emergency surgery that same week. As far as they were concerned, they had removed all of the cancer cells, she said, with one doctor even dubbing it a miracle. The follow-up brain scan showed no evidence of any mass at all, she remembered. The neurosurgeon said the mass had been on the surface of his brain and the wound healed quickly. However, radiation was recommended to stop any chances of recurring cells or possible progress of the disease. "But we wanted to be sure, ’cause he didn't want anything to hamper him being there for his daughters. I never – we never thought he wouldn't be there to walk them both down the aisle. This is the hardest thing I have ever had to do in my life, raising our daughters alone, without him." What followed was six weeks of daily radiation therapy at the BLCTC. In hindsight, McKenzie said she remembered times when technicians were called in and there was talk of the machine overheating or not working at all. Shortly after, she recalled, the seizures began again and a scan revealed a second mass. A second operation was scheduled and doctors discovered that the area had become "rubbery." A biopsy confirmed radiation necrosis. This time, her husband's scar refused to heal properly. But through it "he remained courageous and prayed. We all prayed," she said. They returned to the doctors, who noted another patient had shown similar signs. Her husband's skin had been damaged by the radiation. The McKenzies sought a second opinion in the US, at Jackson Memorial Hospital, Miami. At the emergency unit she met Dr Debra Heros, whose husband was the neurosurgeon. Smokey was quickly sent to that unit and was scheduled for emergency surgery the following day. "We had decided to treat the trip as a mini-vacation, and intended to stay for five days, so the girls were with us. We had no idea what was in store," she said, shaking her head. McKenzie recalled sleeping on a narrow but comfortable couch during the first operation and feeling lost in the corridors of the huge medical complex. And then: "I remember the doctor coming out the theatre and looking crestfallen. His facial expression told me it was bad. Then he said it was the worst case of radiation necrosis he had seen in all his career as a neurosurgeon. My heart dropped, but I refused to let it beat us. We prayed when we felt like crying." It would be the first of five operations in the six months her husband stayed at Jackson Memorial. "I made arrangements for the kids to come back home and I stayed in Jackson with him for those six months. Our girls came up for school holidays and we all stayed in the hospital room with him, as a family. 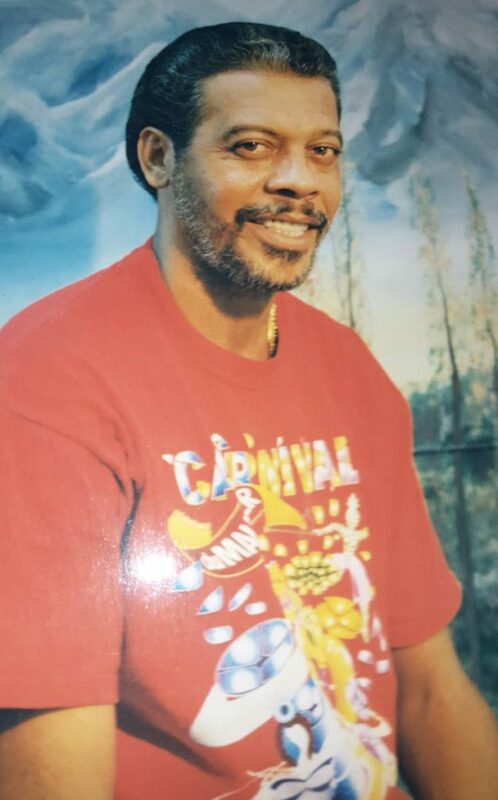 "During our stay in Jackson, Ricardo had five surgeries to remove the recurring necrosis, which kept returning as a result of the damage caused by a radiation overdose. Despite the doctors' efforts, he died on December 21, 2010 in Jackson Memorial. "It was heartbreaking to see this outgoing, vibrant man just deteriorate before my eyes. He spent his last days in Miami with me and his children." Their eldest daughter was with him when he died. McKenzie had been on the train heading to the embassy to have papers processed to extend their stay in the US, so they could remain at his bedside. By this time, her husband was bedridden and in a coma. This December will mark the eighth anniversary of Smokey’s death, yet McKenzie said she hadn't truly been allowed to grieve. For her, his death will always be labelled "senseless", just as if another human being had taken his life. Smokey died at55 from complications arising out of excessive radiation while receiving treatment at the BLCTC. "I truly believe that (otherwise) he would still be here with us today, hyped up about World Cup, walking around the Savannah, playing football, joking with his daughters. Right here next to me, by my side," she said, with a slight catch in her voice. But McKenzie said she promised her husband on his deathbed that she would not let his death be in vain. Doctors at the US hospital were fully supportive of her decision to file a suit against BLCTC, and even testified via videoconferencing. Seven years and several thousands of US dollars later, with the help of her attorneys, McKenzie saw her claim of negligence and loss of earnings deemed substantiated by the presiding judge. She had sued for gross medical negligence, bribery and fraud by Medcorp Ltd and the Cancer Centre of the Caribbean Ltd, operators of the BLCTC, to the tune of $20 million. She said she had mortgaged their home a second time to pay more than US$560,000 for his surgery and rehabilitation. She had also taken over co-ownership of the bar and had received his share of the profits since his death. 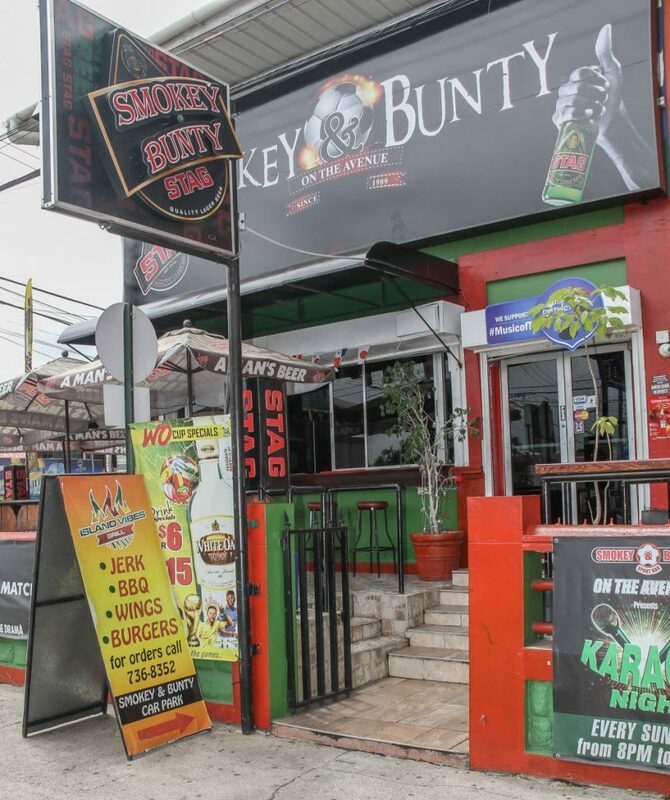 As if that wasn't enough, in 2015 the bar was gutted by fire and remained closed for six months, until its re-opening at Ana Street, Ariapita Avenue. Since winning her case, McKenzie said other patients had reached out to her and she had referred them to her attorneys. "He did not die in vain, ’cause we had to go through this so that others would know... He truly is a hero," she smiled. Soft-tissue radionecrosis of the brain generally occurs in the area of the brain where the tumour was radiated. The resulting brain-tissue necrosis can occur as early as six months after the radiation treatment. Brain-tissue necrosis is a delayed effect of radiation therapy and can occur several years after the radiation treatment, but usually occurs within the first one to two years. Radiation necrosis is usually confined to the area where the tumour originally occurred in the brain but can also involve any structure in the brain that was in the original field of radiation therapy. Whole-brain radiation places the patient at higher risk than if only a small section of the brain was included. The majority of patients who receive radiation therapy do not develop radiation necrosis, but a significant number of patients may develop this serious complication. The risk can be as small as five per cent to as high as about 37 per cent of patients. The risk of developing delayed effects of radiation therapy with resulting brain-tissue necrosis depends on many factors including the dose of radiation, the form of the radiation, the area and amount of brain tissue irradiated, genetic host factors, and use of chemotherapy or radiation-sensitising drugs. Reply to "Lisa McKenzie: A widow’s fight for justice"